If the Christmas leftovers are wearing thin and you're looking for something hot, but simple this chilly (depending on where you are) winter weekend, I have the perfect recipe for you. 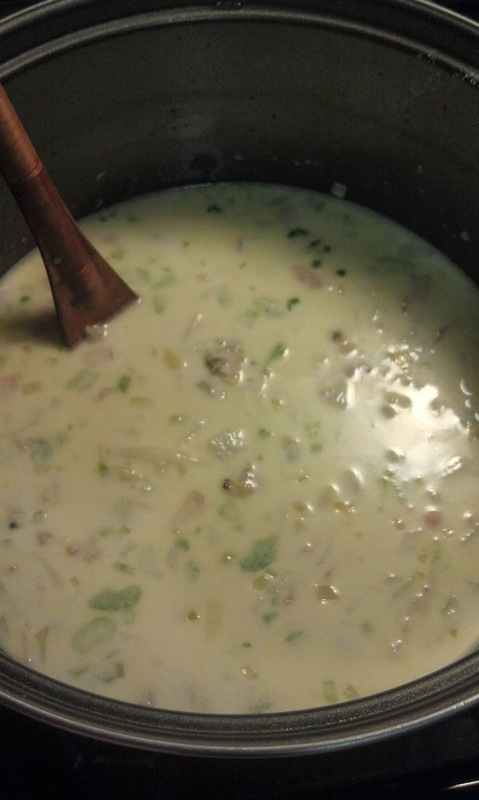 I have to hand it to Rachael Ray...she ran a touchdown with this New England clam chowder recipe. It's not super thick, so, if that's your thing, add more flour. But, for me, it's perfect and creamy enough to coat the spoon. And, like most Rachael Ray recipes, it's ready in 30 minutes or less. 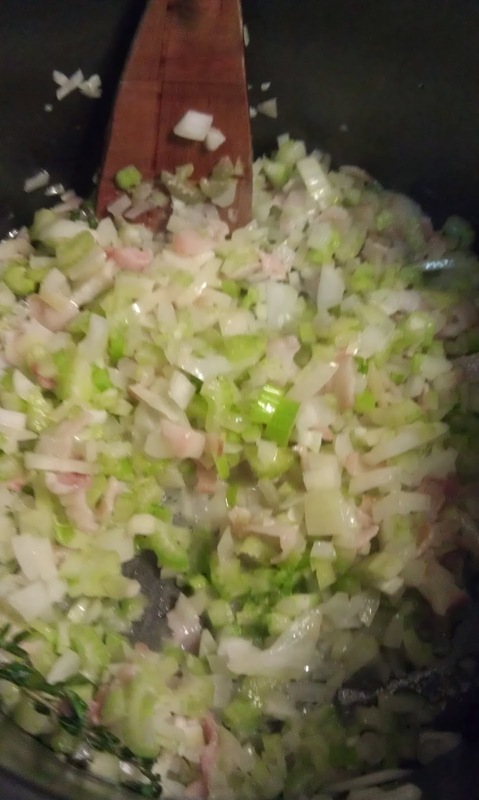 Cook the bacon, onion, and celery, and thyme in the butter over medium-ish heat. Don't burn the butter. Add the stock and half and half. Bring to a bubble. Stir in the potatoes and clams. Bring to a boil. 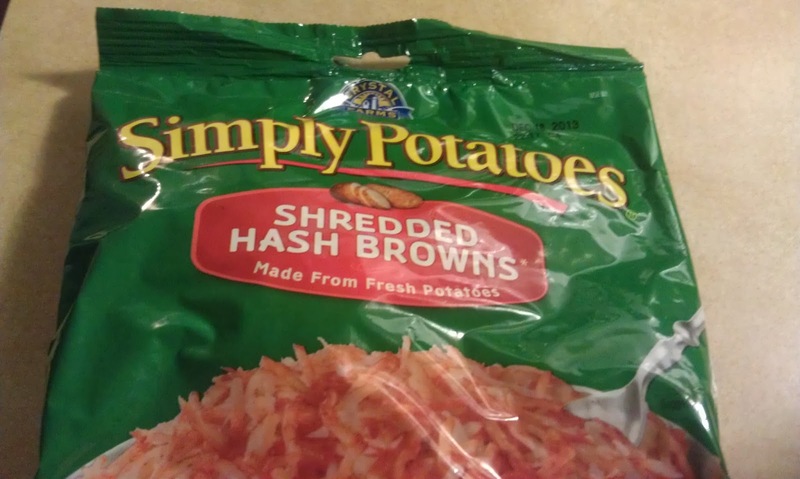 Easiest potatoes ever...I use half of a bag for this recipe. Reduce the heat and simmer for 15 minutes. Salt and pepper to taste. Voila! It smells great and tastes even better. Like I said, it's not super thick, and some purists may poo-poo the bacon and celery, but they give it a great flavor. 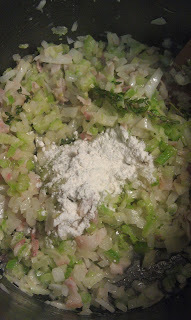 And, again, the fresh thyme makes a big difference in the depth of flavor. Rachael serves hers with open face ham salad on English muffins (mug toppers, she calls them). We've used tuna salad, tuna melts, and plain old grilled cheese. It's a great winter supper. Enjoy, Jen! The recipe is small enough that you won't have a ton of leftovers. For me, it hits the spot. Let me know how you liked it. :-) Cheers! I love the title of your blog! I can't eat clam chowder as I'm allergic to most things that live in the ocean :) I use to live in RI and it was torture being around everyone eating clam chowder and I couldn't even try it! Hi! Thank you so much for stopping by! I hope you come back and visit again soon. Happy New Year! I'm a new follower of Faith and Gasoline. :-) I love the idea of the 101 in 1001. I started my own list...maybe it's time to integrate it into the blog. Thanks again! faithandgasoline -- don't feel bad. 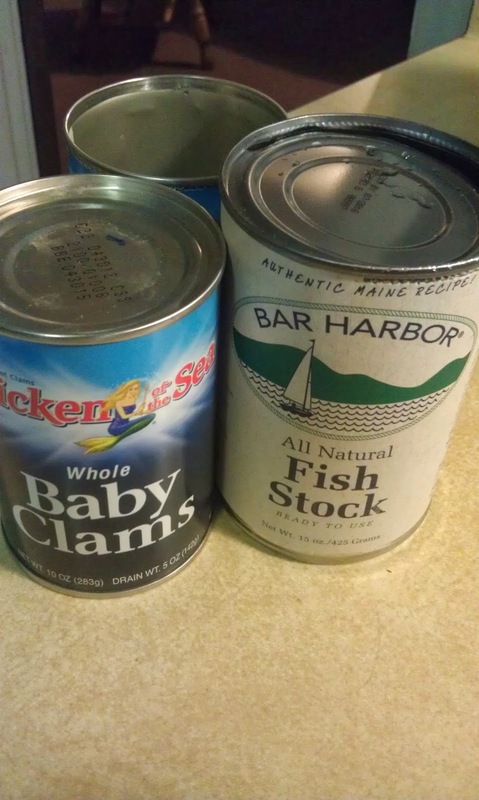 I'm a Maine native and hate seafood. Not allergic, just hate it. People think I'm weird when I tell that lobsters are the cockroaches of the sea, and that there was a law once that we could feed those garbage fish to guys in the state prison only so many times a week. Great blog Kelly. Have a Cohn Chowdah recipe? Hi Craig...you're right about lobsters...they are scavengers...but I still love them. Go figure. I do have a Cohn Chowdah recipe that my grandmother used to make...I need to chat with my mom to get the specifics and then I will test it out. 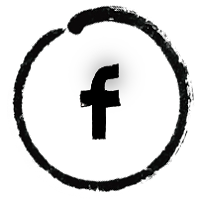 :-) Thanks so much for your visit and for your feedback. Much appreciated! Happy New Year! Cheers!